It’s summertime, the kids are off, and whether you’re at home with them full time or part time, you may be looking for ways to keep them occupied – without breaking the bank! We are going to be bringing you some fun summer activities and adventures over the next few weeks that are FREE or nearly free. For more ideas, search FREE SUMMER in the search bar at the top right. Skateboarding, biking, roller blading, scooters – they’re all the coolest ways for kids to get outside and get active on wheels. While this cooler summer weather may not be as hot as we would like it, it definitely encourages more outside activity without the risk of overheating. Take advantage of that by testing out one of London’s eleven great skate parks across the city. Whether your kid is still using a scooter or a stride bike, or they’re proficient on whatever wheels they can ride, the skate parks are a great place to meet new friends, try new tricks and get in a lot of exercise and fresh air without any resistance from them. If you head out, make sure they’re well suited with a helmet, elbow and knee pads, and possibly some wrist protection. With learning new tricks can come some serious road rash if you’re not careful! 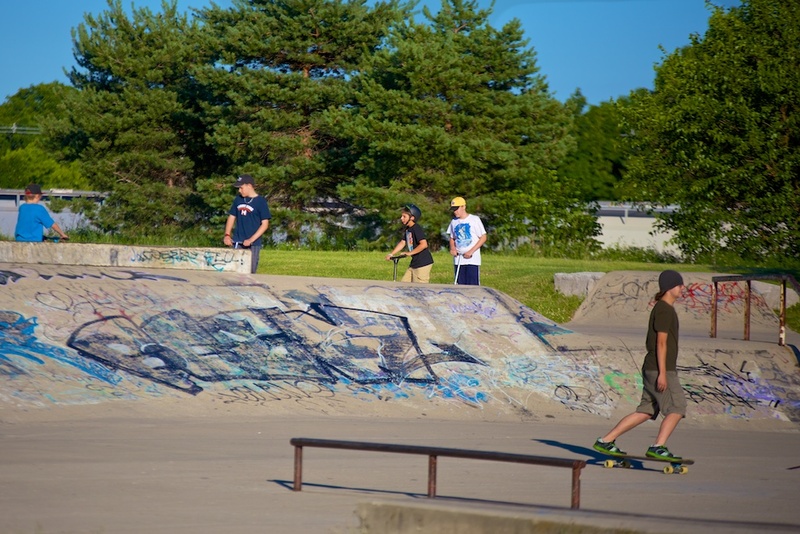 If your kids are too young to ride or you’re not sure if a board is worth the investment, pack a picnic and visit your closest skateboard park with your kids. Watch the other kids, see how interested your kid is in the action and decide where to go from there. Did you know that the City of London Spectrum offers Skateboard Clinics for new riders ages 7-9 and 10-12? Keep up with all of the CoL skate park-related news by following them on Facebook.